These Crunchy Addictive Italian Anise Taralli are, in my humble opinion, the ultimate snack food. Traditional Italian baking can sometimes be a little time consuming, but on the positive side, the recipes are usually really simple and often a lot easier than you think. And it’s almost always better than any commercial product you can buy. The whole process of making these taralli cookies begins by combining some yeast, water and sugar. While the yeast is doing its thing, combine the rest of the ingredients and place in the bowl of your stand mixer. Then it’s just a matter of adding the yeast mixture and letting your stand mixture “knead” the dough for about 10 minutes. 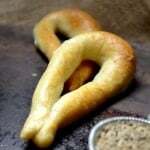 For this particular taralli recipe, I love to use my stand mixer with the dough hook attachment. I keep mine on the lowest setting to prevent over-heating. (Alternatively, you can knead the dough the old fashioned way, just like I did in my Homemade Cavatelli Pasta Dough Recipe). The goal is to obtain dough which is smooth and elastic. Once the dough has been kneaded (manually or mechanically), place in a clean dry bowl and cover loosely with plastic wrap. You can also cover it with a clean tea towel. Let it rest for at least an hour (I will usually prepare the dough and then just “forget” about it for a couple of hours). 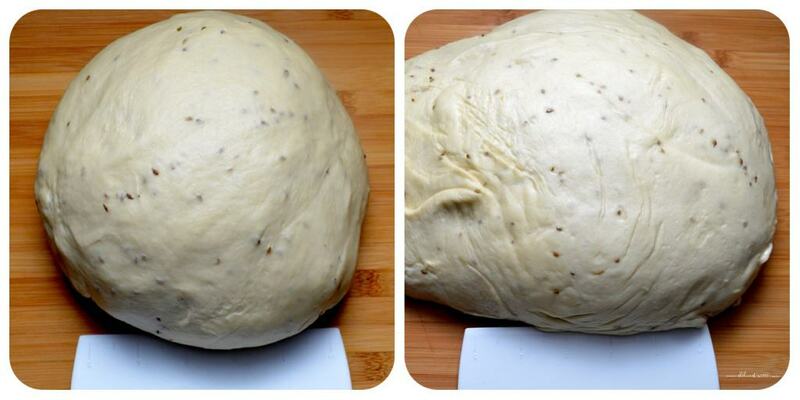 During this rest period, the gluten structure relaxes and the “rested” dough will be a lot easier to roll out. I then place the ball of dough on an un-floured wooden board, knead it a few times before separating the dough into quarters. I will cut each quarter into 16 pieces with my trusty dough scraper. I use a food scale to make sure that each piece of dough weighs approximately 25 grams. Now it’s time to start rolling…take each 25 gram piece of dough and roll it into a rope anywhere 8-10 inches long and about ¼ inch in diameter, about the size of a pencil. Join the two ends together to form an elongated ring and line them up on a wooden board. 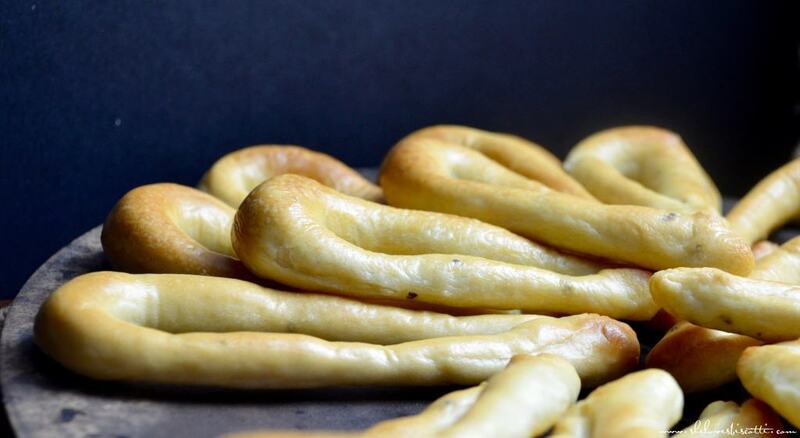 There is no need to flour your cutting board when you are rolling your taralli. 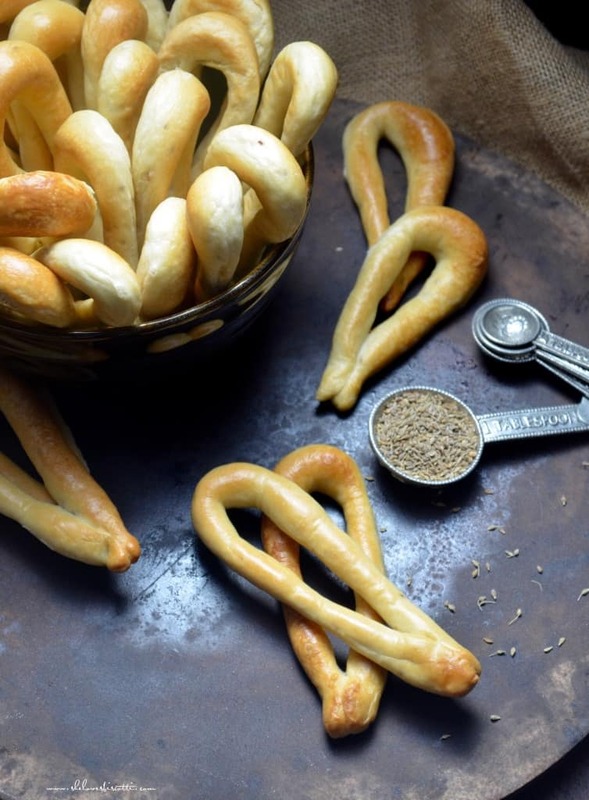 Feel free to adapt any sized ring-shape when you are making these taralli; there is no right or wrong shape, it’s a matter of personal taste. Just like my recipe for Dad’s Favorite Fennel Taralli, this recipe for these Crunchy Addictive Italian Anise Taralli need to take a dip in boiling water before they are baked. So once I have shaped about half of the dough into taralli, I bring a large pot of water to a simmer. Carefully drop 3-4 taralli at a time (without crowding) in the boiling water. As soon as they rise to the top, remove them with a slotted spoon and place them on a baking rack to air dry. This is what the process of boiling taralli should look like. It only takes a few seconds for the taralli to rise to the top. Once this step is complete, you are ready to bake your taralli. I will usually place the taralli directly on the oven grates and bake them at 375 °F for approximately 10 minutes and then reduce the temperature of the oven to 350 °F for another 10-15 minutes. The final product should be golden brown and crisp. If you prefer your taralli to have less of a crunch, start checking the texture after 15 minutes (of total baking time) and pull them out when you want. A colleague of mine recently shared his mom’s recipe for these Crunchy Addictive Italian Anise Taralli. She is originally from the beautiful region of Calabria in Southern Italy, from the city of Cosenza. My colleague tells me that his mom, along with her friends, will make these taralli as a fundraiser activity for their local church. Since these women make thousands of these taralli, they use a sausage attachment to press out the dough in long coils. Then it’s just a matter of cutting the dough and forming the rings. Isn’t that just a genius idea! As I have previously mentioned, there truly are so many variations of this simple Italian snack food. You can choose to add (or not add) yeast, water, eggs, wine, fennel, anise, rosemary, salt, black pepper, red pepper flakes… there is so much room for creativity here. I should also mention that taralli originate from lots of different regions in Italy, like Bari (taralli Baresi), Puglia (taralli Pugliese), Calabria (taralli Calabrese), Napoli (taralli napoletani), and so on. And of course, each place has their own take on taralli. 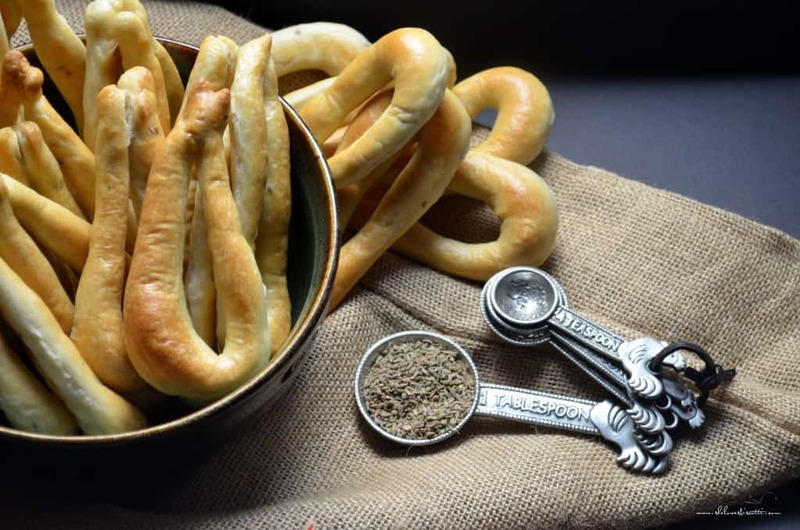 I find it so interesting when a recipe is embraced and tweaked by so many families in so many places, and so my colleague’s taralli definitely excite me! Forget the bag of chips! The next time you feel like snacking, make sure you have some of these Crunchy Addictive Italian Anise Taralli on hand. 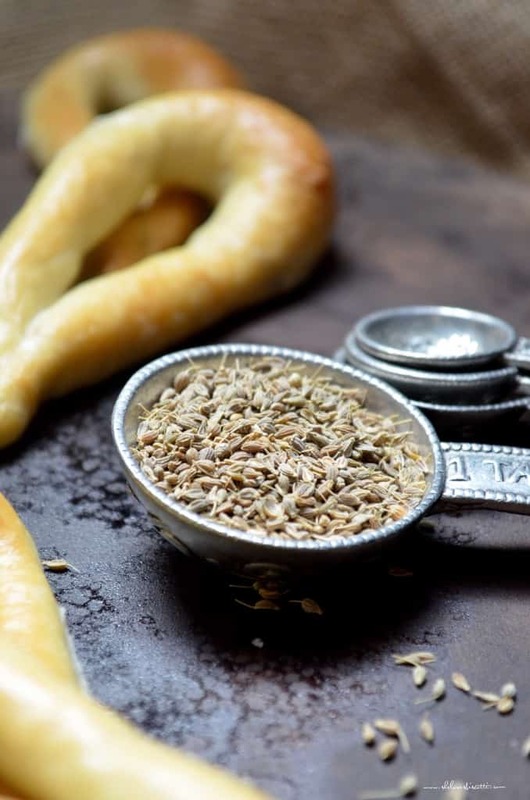 ★★★★★ If you have made this taralli recipe, I would love to hear about it in the comments below and be sure to rate the recipe! Forget the bag of chips! This recipe for these Crunchy Addictive Italian Anise Taralli taste like a gourmet version of a breadstick. Great for snacking. In a small bowl, combine yeast, sugar and water. Stir and let stand for 10 minutes (will get foamy). In the bowl of a stand mixer, combine the rest of the ingredients. With dough hook attachment knead for approximately 10 minutes until you have a soft, smooth elastic dough. Alternately, you can knead by hand. Cover loosely with plastic wrap and tea towel and allow dough to rest for at least 1 hour. Place the ball of dough on an un-floured wooden board. Knead the dough for about 1 minute. Separate the dough into quarters (cover the dough you are not using). Cut each quarter into 16 pieces. (each piece should weigh about 25 grams-almost 1 oz). 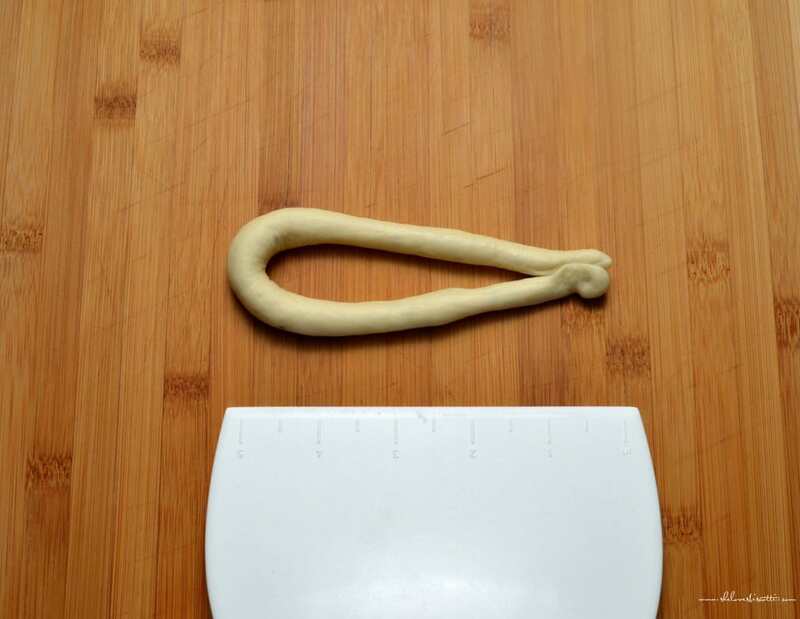 Roll each 25 gram piece of dough into a rope approximately 8 inches long and ¼ inch in diameter (about the size of a pencil). Join the two ends together to form an elongated ring and line them up on a wooden board. (There is no need to flour your cutting board when you are rolling your taralli. 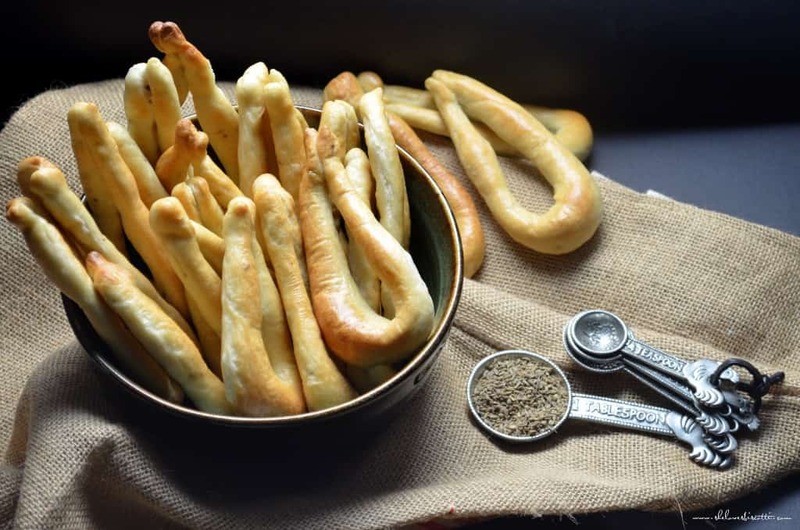 Feel free to adapt any sized ring-shape when you are making these taralli; if you want thin crispy taralli, the diameter must be ¼ inch thick). Make sure that you press the ends firmly together. Bring a large pot of water to boil, then reduce heat so that the water simmers. Plunge the taralli in boiling water; 3-4 at a time. Once they surface to the top, remove with slotted spoon. The boiling process (per batch) should take less than 15 seconds. Place on cooling rack to drain. Repeat process until all the taralli have been boiled. Place boiled taralli directly on oven grates or on a parchment lined cookie sheet. Bake in a preheated oven at 375° F for 10 minutes, then lower heat to 350° F for another 10-15 minutes until golden brown and crisp. (Set oven rack in the center). Taralli will last about 1 month when stored in a dry place. I will usually keep mine in a basket, uncovered. I prefer to use the more pronounced taste of olive oil in my taralli. Feel free to use a vegetable or canola oil. Thanks so much Rina! I am thrilled to hear you enjoyed these anise taralli. They really are so addictive… I can understand why you need to have a secret stash 🙂 Thanks again for taking the time to comment, appreciate it! I think perhaps I am doing something wrong? I had these in Italy last fall and have run out of the stash I brought back with me. Mine have gotten kind of hard and chewy…not the crispy that I wanted. I do live in a very humid environment (Houston). Should I bake longer at a lower temperature? HELP! I haven’t given up quite yet. 🙂 I also noticed that mine take a bit longer than a few seconds to float to the top. Could it be the humidity? Thanks for stopping by Wendy. Let’s see if I can help. You are describing the taralli as hard and not crispy… this is what I would do: First, check to make sure your oven is properly calibrated. Next, I would make a trial run and bake them for a shorter period. Perhaps this simple modification will give you the desired texture. Humidity can play a factor, but once you get the “right” dough and the “right”oven temperature you will be a taralli pro! Let me know how it goes! What kind of white wine do you use? Dry? Sweet? Semi? For some reason tadals popped into my head earlier. My childhood friend’s mom used to make them at Easter time. I loved them and looked forward to them every year. Hers were anise flavored and made with black pepper. They were spicy hot but oh so good. They were very hard but we didn’t care because they were so delicious! Glad I found this site after googling. I haven’t had them in years. I love how certain foods can trigger childhood memories. My family would also refer to them as “tadals”. 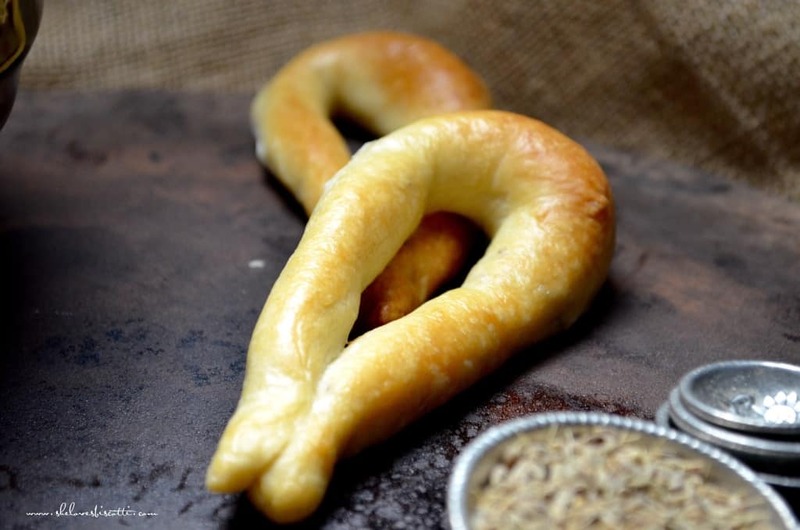 One of the wonderful things about taralli is that you can make them as peppery as you want! I am also glad you found my site Debra ♥ Thanks so much for sharing!